The Quality Management Systems (QMS) course is a self-directed course for laboratory quality assurance and testing professionals working in veterinary diagnostic laboratories. The topics in this course are also applicable to many other types of laboratories and facilities where quality standards and principles are similar. In this on line course, experts in the field of laboratory quality management systems present short, interactive videos and practice exercises to teach the basic requirements of a quality system, ways to implement specific components in a laboratory and how to use quality system tools to continuously improve the quality of laboratory results. Each sub-topic can be completed as your schedule allows. Certificates will be provided after passing individual topics and the entire course. 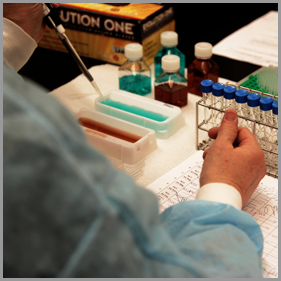 Laboratories in the United States and around the world produce information critical to animal disease surveillance, disease identification, and eradication. To establish confidence in diagnostic test results, laboratories must have well-implemented and well-managed quality management systems. Additional national and global sources for training in quality system principles and practices are needed to assist laboratory staff in understanding, developing and implementing quality systems. This course was designed to help address that need. Development of this course has been funded by the United States Department of Agriculture, Animal and Plant Health Inspection Service (USDA, APHIS), Veterinary Services and the USDA, APHIS Plant Protection and Quarantine, through an agreement with the Washington Animal Disease Diagnostic Laboratory and the Paul G. Allen School for Global Animal Health. As the course continues to develop, it is hoped that the materials will be used as a tool to improve laboratories worldwide and will provide a basis for more consistent, standardized quality systems and, as a consequence, more accurate and reliable test results accepted with confidence by animal and public health professionals globally. Course registration is complimentary. Information collected during registration and the process of completing the topics will be used to develop additional materials and exercises as well as to improve existing materials.